It's Not Rocket Science: Yayyyy New Rug! My living room rug came in! Like... 2 weeks ago or something. I am still excited. I had searched eeeeverywhere for a decent wool rug for the living room, with the right colors and patterns and stuff. And finally I found this rug at Home Depot, but then it was out of stock! NO! 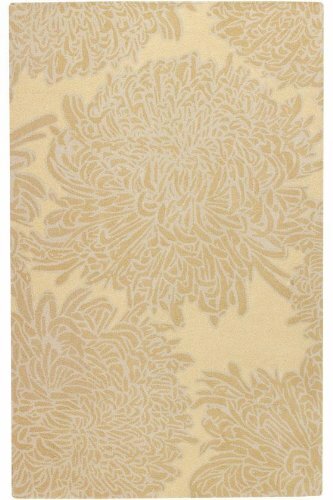 After finding this rug, I kept looking, sometimes scrolling through 500 rugs at a time on rugworld.com or whatever super rug warehouse, but nothing compared to the perfection of this chrysanthemum rug. And then... I found it again! It was at Home Decorators Collection, which is actually a subsidiary of Home Depot, but it said it wasn't available until March. This was in October or something that I was looking, and March seemed very far away. But I kept checking back, and after Christmas, all of a sudden IT WAS AVAILABLE! So I promptly ordered it and anxiously awaited Chris calling me to tell me it arrived. It is 100% wool. I guess I have nothing against synthetic fibers, but I didn't like the Target rug we had purchased at first, just to get something on the floor. So, Chris was nice and waited for me to go up to the house before opening the rug package. And we ditched my old Ikea laminate coffee table and put in the bamboo table I got from Goodwill for $9.00 and spraypainted with black lacquer, and topped it with the super-thick 42" diameter glass that I got for $25 off of Craigslist. I like it, but I think the table might end up spraypainted white instead. The black is awfully heavy-looking. I really wish the black woven base part was not there, but it is a good spot to put a plant or something and coffee table books and stuff.